Firestone Tire and Rubber Company is an American tire company founded by Harvey Firestone in 1900 initially to supply solid rubber side-wire tires for fire apparatus, and later, pneumatic tires for wagons, buggies, and other forms of wheeled transportation common in the era. Firestone soon saw the huge potential for marketing tires for automobiles, and the company was a pioneer in the mass production of tires. Harvey Firestone had a personal friendship with Henry Ford, and used this to become the original equipment supplier of Ford Motor Company automobiles, and was also active in the replacement market. Firestone was originally based in Akron, Ohio, also the hometown of its archrival, Goodyear, and two other midsized competitors, General Tire and Rubber and BFGoodrich. Founded on August 3, 1900, the company initiated operations with 12 employees. Together, Firestone and Goodyear were the largest suppliers of automotive tires in North America for over 75 years. In 1906, Henry Ford chose Firestone to supply tires for its car models. 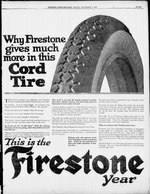 In 1918, Firestone Tire and Rubber Company of Canada was incorporated in Hamilton, Ontario, and the first Canadian-made tire rolled off the line on September 15, 1922. 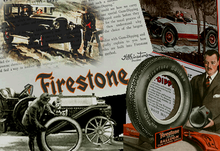 During the 1920s, Firestone produced the Oldfield tire, named for racing driver Barney Oldfield. In 1926, the company opened one of the world's biggest rubber plantations in Liberia, West Africa, spanning more than one million acres (1,560 sq mi; 4,050 km2). Also that year, the company opened its first Firestone Tire and Service Center (later renamed Firestone Complete Auto Care). Firestone Complete Auto Care is the division of Firestone that offers automotive maintenance and repair, including tires. In 1927, Henry Ford and Harvey Firestone took a trip to southern California to select locations for their new factories. Friends say Ford wanted to be near the ocean and picked Long Beach and suggested Firestone go to South Gate. The tiny community southeast of downtown Los Angeles was mostly agricultural at the time and Firestone found 40 acres (16 ha) of beanfield to house his new manufacturing plant. Architects Curlett and Beelman created a spectacular four-story Italianate complex, with its own power plant and gorgeous polychrome murals by Gladding, McBean depicting the tire and rubber-making process. A year after the plant opened in 1928, it doubled in size, and grew to nearly one million square feet (23 acres; 9.3 ha) by 1954. The town grew around Firestone, its main boulevard was named after Harvey, and Los Angeles became the number one tire market in the country. By the mid-1970s, Ford and GM had massive layoffs as Firestone and other manufacturers opened new plants in non-union locales like Wilson, North Carolina. After considerable downsizing, the end at South Gate came in 1980 when 1,300 workers were laid off and the plant closed. East Los Angeles College has proposed a new satellite campus at the site. In 1928, the company built a factory in Brentford, England, a longtime Art Deco landmark on a major route into the city; this closed in 1979. In 1936, the company opened a plant in Memphis, Tennessee. With a work force exceeding 3,000 employees, the Memphis plant was the largest tire manufacturer in the company's worldwide operation. On July 1, 1963, the company celebrated the production of 100 million tires in Memphis. The plant was closed in 1982. On October 11, 1941, the Firestone Rubber and Latex plant in Fall River Mass had 5 out of 8 buildings and at least 15,000 tons of rubber destroyed by fire. The fire incurred $12 million in damage ($205 million in 2019 dollars). During World War II, the company was called on by the U.S. Government to make artillery shells, aluminum kegs for food transport, and rubberized military products. Barrage balloons were produced at Akron. Firestone ranked 55th among U.S. corporations in the value of wartime military production contracts. In the 1940s, Firestone was given a defense contract to produce plastic helmet liners; while outproduced by Westinghouse Electric, they still made a fair amount for the M1 Helmet. In 1951, Firestone was given the defense contract for the MGM-5 Corporal missile. Firestone was given a total of $6,888,796 for the first 200 units. Known as the "Embryo of the Army," it was a surface-to-surface guided missile which could deliver a high-explosive warhead up to 75 nautical miles (140 km). It was later modified to be able to carry a nuclear payload for use in the event of Cold War hostilities in Eastern Europe. Built in southern California, this missile was replaced in 1962 by the MGM-29 Sergeant system. In 1961, Firestone acquired the Dayton Tire division from the Dayco Corporation. Dayco later sued both Firestone and Goodyear, alleging that the two companies conspired to monopolize the tire industry in the United States. The United States District Court dismissed the lawsuit. In late 1979, Firestone brought in John Nevin, the ex-head of Zenith Electronics, as president to save the hemorrhaging company from total collapse. It was more than a billion dollars in debt at the time, and losing $250 million a year. Nevin closed nine of the company's seventeen manufacturing plants, including six in one day, and relocated the company from its ancestral home in Akron to Chicago. He spun off non-tire related businesses, including the Firestone Country Club; it was considered a deliberate plan to boost the stock price, and it paid off. In 1988, after discussions with Pirelli, Nevin negotiated the sale of the company to the Japanese company Bridgestone, which was able to buy the company for much less than it had been worth a decade and a half earlier. The combined Bridgestone / Firestone North American operations are now based in Nashville, Tennessee. The companies celebrated a 20-year anniversary of the merger in 2008, and changed the tire division name to Bridgestone Americas Tire Operations, LLC. In 2012, Bridgestone Americas opened a $100 million technical center in Akron. Apart from tires, several companies and divisions operate with the Firestone brand in its name. These companies include Firestone Building Products, LLC, Firestone Industrial Products, LLC, Firestone Complete Auto Care, Firestone Natural Rubber Company, and Firestone Specialty Products. Firestone Building Products and Firestone Industrial Products are headquartered in Indianapolis and operate in 23 U.S. states and ten countries, with 11,000 employees worldwide; its annual sales exceed $2.5 billion. In 1972, Firestone received a ten-year import "concession" by the Kenyan government to secure Firestone's investment in a domestic tire plant, which gave it a virtual monopoly. This included both general price and foreign exchange controls. When the 10-year period came to an end in 1979, Firestone retaliated by increasing production, making entry less attractive. Headquarters eventually canceled expansion and failed negotiations lead to no further investments. Firestone tires used for the Indianapolis 500 race. Bridgestone moved their corporate office to downtown Nashville in October 2017. The Indianapolis 500 auto race was won in 1911 by a car running Firestone tires, as did all winners of the race from 1920 to 1966. The company also provided tires to Formula One from 1950 to 1974. Citing rising costs as the cause, Firestone announced its withdrawal from professional motorsport in August 1974 with the exception of Formula 5000 and Formula One. The change was forecast to reduce Firestone's annual race testing budget from between $6 and $8 million to around $500,000. Shortly afterwards, Firestone extended this to a complete withdrawal by the end of the 1974 season. The manufacturer returned in 1995 to the CART series with technical assistance from Bridgestone. 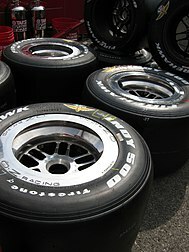 Goodyear retired after 1999, thereby leaving Firestone as the single supplier of the IndyCar Series as of 2018. In 1950, Firestone along with General Motors and Standard Oil, were charged and convicted of criminal conspiracy for their part in the Great American streetcar scandal. The scandal included purchasing streetcar systems throughout the United States and dismantling and replacing them with buses. Radial tires were introduced to the U.S. market by rivals Goodrich and Michelin in the late 1960s, and Firestone lacked their own radial tire. The first radial tire developed and produced by Firestone was the ill-fated Firestone 500 Radial. Manufacturing of the new tire was performed on equipment designed to manufacture bias-ply tires. During the 1970s, Firestone experienced major problems with the Firestone 500 radial. The Firestone 500 steel-belted radials began to show signs of separation of the tread at high speeds. While the cause was never proved, it is believed that the failure of bonding cements, used by Firestone to hold the tread to the tire carcass, may have allowed water to penetrate the tire which in turn may have caused the internal steel wire to corrode. In March 1978, the U.S. National Highway Traffic Safety Administration (NHTSA) announced publicly a formal investigation into defects of the Firestone 500. The NHTSA investigation found that the tread separation problem was most probably a design defect affecting all Firestone 500's. In 1973, only two years after the 500's debut, Thomas A. Robertson, Firestone's director of development wrote an internal memo stating "We are making an inferior quality radial tire which will subject us to belt-edge separation at high mileage". Firestone introduced strict quality control measures in an attempt to fix the inherent problems, however they were not successful in totally eliminating the basic faults. In 1977 a recall of 400,000 tires produced at the problematic Decatur plant was initiated. Firestone was considered to be less than cooperative with the NHTSA during the agency's investigation into the Firestone 500. Firestone blamed the problems on the consumer, stating underinflation and poor maintenance. On October 20, 1978, Firestone recalled over 7 million Firestone 500 tires, the largest tire recall to date. Congressional hearings into the 500 also took place in 1978. The tire was found to be defective and the cause of 250 deaths. In May 1980 after finding that they knew the tires were defective, the NHTSA fined Firestone $500,000 USD, which at that time was the largest fine imposed on any U.S. corporation and the largest civil penalty imposed since passage of the 1966 National Traffic and Motor Vehicle Act. Multiple lawsuits were settled out of court and the constant negative publicity crippled the company's sales and share price. Harvard Business School and Wharton School of the University of Pennsylvania taught classes and wrote papers on the issues of misjudgments and poor decision-making by the management of Firestone. After years of bad publicity and millions paid out in compensation to victims, Firestone was losing vast amounts of money, and its name was severely damaged. Firestone established the Firestone Natural Rubber plantation in Harbel, Liberia in 1926. From 1926 until the outbreak of the First Liberian Civil War in 1990, the Firestone Natural Rubber Company was the largest plantation of its kind in the world. In September 1990, rebel NPFL forces (led by Charles Taylor, who would later be convicted of war crimes) executed sitting Liberian president Samuel Doe and seized the Harbel plantation. Firestone had to evacuate its American workers as a result. In June 1991, Firestone sent a delegation to Monrovia in an attempt to restart operations in Harbel. After a month of waiting, the delegation was brought to meet Taylor, and after a further six months of negotiations the company signed a Memorandum of Understanding (MOU) with the National Patriotic Reconstruction Assembly Government's Ministry of Finance in January 1991. This MOU provided for taxes to be paid by Firestone to the Taylor government, and for the Taylor government to provide protection to Firestone's employees and assets in Liberia. Firestone resumed operations in March 1992, but once again had to halt in October that same year as hostilities escalated. Over this period, the company had paid $2.3 million in taxes to the Taylor government, which some say helped legitimize Taylor's Greater Liberia government and finance and enable its attack on ECOMOG controlled Monrovia. Operations did not fully restart until 2003 at the conclusion of the Second Liberian Civil War. Since the end of the war, Firestone has invested over $100 million in restoring and rebuilding its facilities in Liberia. The company's ventures in Liberia have been the subject of considerable scrutiny and criticism, including a 2005 Alien Tort Claims Act case brought in California by the International Labor Rights Fund and a 2014 investigative report by ProPublica entitled "Firestone and the Warlord", and a PBS Frontline documentary by the same name. In 1996, several state agencies in Arizona began experiencing major issues with Firestone tires on Explorers. According to news reports, various agencies demanded new tires, and Firestone conducted an investigation of the complaints, tested the tires and tried to assert that the tires had been abused or under-inflated. ...There are a number of parallels between this recall in 2000 and the 1978 recall of the Firestone 500...there was a documented coverup by Firestone of the 500 defect, spurred by the lack of a Firestone replacement tire. When the coverup was disclosed, the top management of the company was replaced as Firestone was severely damaged in reputation and economically. But a key difference is that the Firestone 500 was used on passenger cars, which rarely rolled over with tire failure. NHTSA documented 41 deaths with the 500, a recall, involving seven million tires. The report went on to indicate that Ford also had been complicit, stating that The Ford Motor Company had instructed Firestone to add a nylon ply to the tires it manufactured in Venezuela for additional strength and that Ford had made suspension changes to the Explorer model available in Venezuela. Ford did not specify adding the nylon ply for U.S.-made Firestone tires nor did it change the Explorer suspension on U.S. models at this time. An abnormally high failure rate in Firestone's Wilderness AT, Firestone ATX, and ATX II tires resulted in multiple lawsuits, as well as an eventual mandatory recall. In 2001 Bridgestone/Firestone severed its ties to Ford citing a lack of trust. The lack of trust stemmed from concerns that Ford had not heeded warnings by Bridgestone/Firestone relating to the design of the Ford Explorer. In 2006, Firestone announced renewed efforts to recall tires of the same model recalled in 2000 after the tires were linked to recent deaths and injuries. According to Firestone's last filing with the National Highway Transportation Administration, only 90,259 of more than 2.5 million recalled tires were confirmed as removed from service. In November 2013, two recalled Wilderness AT tires were found in Atlanta, Georgia. One of the tires was offered for sale as new at a used tire retail shop. Some outside observers have speculated about the blame worthiness of both parties. Firestone's tires being prone to tread separation and failure, and the SUVs being especially prone to rolling over if a tire fails at speed compared to other vehicles. A subsequent NHTSA investigation of real world accident data showed that the Ford Explorer SUVs in question were no more likely to roll over than any other SUV, after a tread separation. Where the Rubber Meets the Road is an advertisement jingle that was frequently used in the 1960s and 1970s, especially on televised sporting events. The jingle was sung by Don Rondo. Bridgestone/Firestone also produces tires under the Fuzion brand name. Fuzion is a tire manufactured in China for Bridgestone/ Firestone as a budget replacement tire. Makes include the Fuzion UHP Sport A/S, SUV, and Touring. ^ "Bridgestone Americas History". Bridgestone Americas, Inc. Retrieved 8 November 2018. ^ "A Global Dream". Bridgestone Americas. Archived from the original on 16 February 2013. Retrieved 3 August 2013. ^ "History of Bridgestone/Firestone". Bridgestone/Firestone Canada. 2009. Archived from the original on 10 May 2010. ^ "Barney Oldfield". Ohio History Central. Ohio History Connection. Retrieved 8 November 2018. ^ Chris Nichols (2013-03-01). "DispL.A. 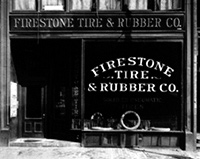 Case #52: L.A.'s First Firestone Tire - Los Angeles Magazine". Lamag.com. Retrieved 2015-12-17. ^ Lauderdale, Vance. "Firestone Tire & Rubber Company". Memphis Flyer. Retrieved 19 February 2019. ^ "Firestone Closings". 18 August 1982. Retrieved 19 February 2019 – via NYTimes.com. ^ Selleck, A (November 1, 1941). "Rubber Fire at Fall River Causes $12,000,000 Loss". www.fireengineering.com. ^ Wire service, “Barrage Balloons In Production,” The San Bernardino Daily Sun, San Bernardino, California, Monday 26 January 1942, Volume 48, page 9. ^ "Corporal". Redstone Arsenal. Archived from the original on 2007-03-10. Retrieved 2007-03-22. ^ Dayco Corporation v. Firestone Tire & Rubber Co. , 386 F. Supp. 546 (N.D. Ohio). ^ "Firestone leaving Akron". Toledo Blade. (Ohio). Associated Press. May 1, 1987. p. 20. ^ "Old & Dangerous?". Tire Review Online. Archived from the original on 2007-09-27. Retrieved 2007-03-22. ^ "Tire industry loses two giants". Tire Business. 2006-06-05. Archived from the original on 2007-09-28. Retrieved 2007-03-22. ^ Stephen Koepp (1997-02-16). "The Companies". Time. Retrieved 2007-03-22. ^ "Bridgestone Americas Celebrates Topping Out of New Headquarters" (Press release). Bridgestone Americas. April 7, 2017. Retrieved August 2, 2018. ^ "Firestone Cutback Likely". The Kingsport Times. Ancestry.com#Newspapers.com. 14 August 1974. (Subscription required (help)). ^ "Andretti Dream Threatened". The Los Angeles Times. Ancestry.com#Newspapers.com. 30 August 1974. (Subscription required (help)). development, production and service of U.S Auto Club championship and Formula racing cars will be phased out by the end of the 1974 season. ^ Chomsky, Noam (1999). Year 501: the Conquest Continues. South End Press. ISBN 0-89608-444-2. ^ "History". Jags.org. Retrieved 2015-12-17. ^ "Forewarnings of Fatal Flaws". Time. 1979-06-25. Retrieved 2007-03-22. ^ rehan, khan. "Timeline of key events in the history of Ford and Firestone". St. Petersburg Times. Retrieved 2007-03-22. ^ a b "Firestone's Second Big Tire Blowout". Wharton School of University of Pennsylvania. 2000-08-30. Retrieved 2007-03-22. ^ Donald N. Sull (2000-11-27). "The Dynamics of Standing Still: Firestone Tire & Rubber and the Radial Revolution". Harvard Business School. Retrieved 2007-03-22. ^ "Joint Committees Deliver Opening Statements at Congressional Hearing on Firestone Recall". CNN. 2000-09-06. Retrieved 2007-03-22. ^ Keith Bradsher (2000-09-04). "Stricter Rules for Tire Safety Were Scrapped by Reagan". The New York Times. Archived from the original on 2007-06-12. Retrieved 2007-03-22. ^ "A bumpy road for the radial-ply tire". USA Today. 2000-12-26. Retrieved 2007-03-22. ^ a b Miller, T. Christian. "Firestone and the Warlord - Intro". www.propublica.org. Pro Publica. ^ "Liberia Profile - Timeline". BBC - British Broadcasting Company. ^ Miller, T. Christian. "Firestone and the Warlord - Chapter 3". www.propublica.org. Pro Publica. ^ Miller, T. Christian. "Firestone and the Warlord - Chapter 4". www.propublica.org. Pro Publica. ^ "Frequently Asked Questions". firestonenaturalrubber.com. Firestone Natural Rubber. ^ "Investing in Liberia". firestonenaturalrubber.com. Firestone Natural Rubber. ^ "Firestone Claim". socialfunds.com. Archived from the original on 2007-02-06. Retrieved 2007-03-23. ^ Miller, T. Christian. "Firestone and the Warlord". www.propublica.org. ProPublica. ^ "Firestone and the Warlord". www.pbs.org. PBS Frontline. ^ "Statement of Joan Claybrook On Firestone Tire Defect and Ford Explorer Rollovers Before the Transportation Subcommittee United States Senate Committee on Appropriations". Public Citizen. 2000-09-06. Retrieved 2007-03-21. ^ Isidore, Chris (May 21, 2001). "Firestone severs ties to Ford". CNN. ^ "Firestone Jingle". Firestone. Archived from the original (QuickTime) on 2006-10-17. Retrieved 2007-03-22. Wikimedia Commons has media related to Firestone.